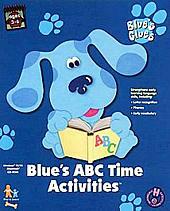 Blue's ABC Time Activities software is based on Nickelodeon’s preschool television program "Blue’s Clues." It features a human host (Steve) and a cast of two-dimensional animated characters including the fun-loving spotted dog, Blue. Blue has an interactive word book, in which enjoyable stories can be created from simple, everyday words. Initially, the stories are incomplete. The child is asked to help Blue and her friends in a series of pre-reading activities to earn the words needed to complete the stories in Blue’s word book. Although the activities themselves aren’t particularly exciting or innovative, they’re well presented and easy to execute. Kids can choose to complete word puzzles, navigate alphabet mazes, create bathtime rhymes, receive, edit and read personalized mail, and learn beginning word sounds with jungle animals or favorite snack foods. A letter of the alphabet is earned for each correctly completed task, and words are made from accumulated letters. At any time the child can choose to visit the word book, where color coded words are inserted into identically coded stories. As each story is completed, Blue draws an accompanying illustration. The book pages can then be printed for away-from-computer appreciation and enjoyment.